Painting each room in the color of the life area where it is located. Painting the foyer black or navy blue, in the hopes to attract money or improve your career. Placing huge cures for the life areas, in hopes of getting faster results. Putting money cures in the wealth corner. Replacing incandescent lights with fluorescent light bulbs. Clutter behind doors and in hallways. Giving your power away to fortune telling or superstitious beliefs that have become attached to Feng Shui. Using Feng Shui as if it was magic, e.g. to try to get someone to love you. Putting things on the floor that were not designed to go on the floor. In the next few weeks we will be addressing each of the above topics in depth. The scariest thing about some of the ten items above, is that some Feng Shui consultants and teachers actually recommend that you do them. Remember that not all advice is good, even if it is printed in a popular Feng Shui book or if the person who said it is famous. 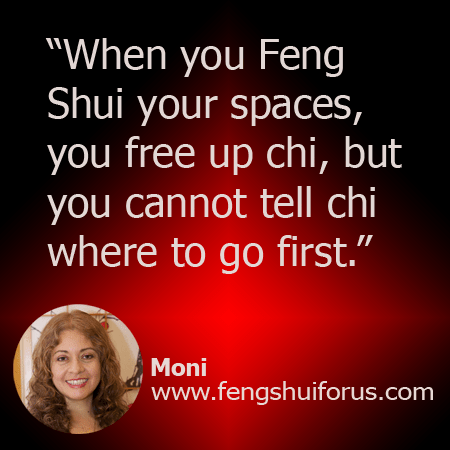 Feng Shui is based on the same principles of natural law as acupuncture, and good Feng Shui is not a matter of opinion, but of understanding reality. If you DO NOT love bad Feng Shui, consider taking a class. You can start any time and advance at your own pace.